We hosted our 'Mad Hatters Mar-tea-ni Masterclass' on Saturday, a new concept which we have been working on with Black Cow Vodka (the worlds only pure milk vodka) and Tea Pigs tea to create a milk + tea martini masterclass! Our aim for this event is to create a fun, interactive experience which strips back the pretence of cocktail shaking and transforms it into something that people will learn is simple, fun and interesting when shaking and experimenting with different flavours. Having been greeted with earl grey bubbles, guests were excited to investigate the table (littered with golden tea pots filled with Tea Pigs syrups, fresh fruit and veg, Black Cow vodka bottles, tote bags, fabric pens and more fun surprises) and get shaking! Jeremy demo'd a Rosemary + Orange Earl Grey Martini in order to show how the basic Martini is shaken. This was followed by a tasting of a shot of the unbelievably smooth Black Cow vodka and a bite of their velvety cheddar cheese - a real treat for the tastebuds. The highlight was when guests got to shake up their own concoctions mixing up different herbs, fruits and tea syrups with the Black Cow vodka to form their very own bespoke mar-tea-ni, accompanied by DIY tea bags which were filled with different infusions. We love seeing how creative people can get when they switch off from everyday life and get absorbed into alcohol fuelled creativity. 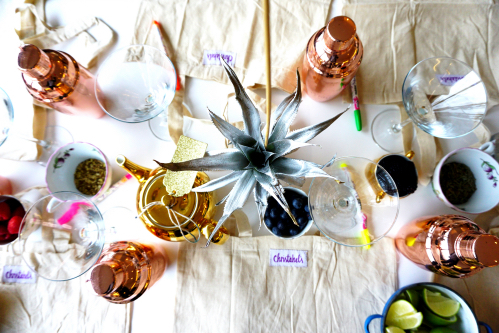 The tote bags were a fun addition as they were scrawled over with designs and martini recipes, creating a bespoke recipe bag to take home - whoopla!